Crimson columbine is a colorful and delicate-looking woodland plant that does best in a cool, partially shaded location where the soil does not dry out during the growing season. It will do fine in full sun as long as there is sufficient moisture and no reflected heat. Hummingbirds and bumblebees love the nectar the flowers provide, and songbirds and chipmunks eat the shiny black seeds. This columbine is native to much of the western United States. 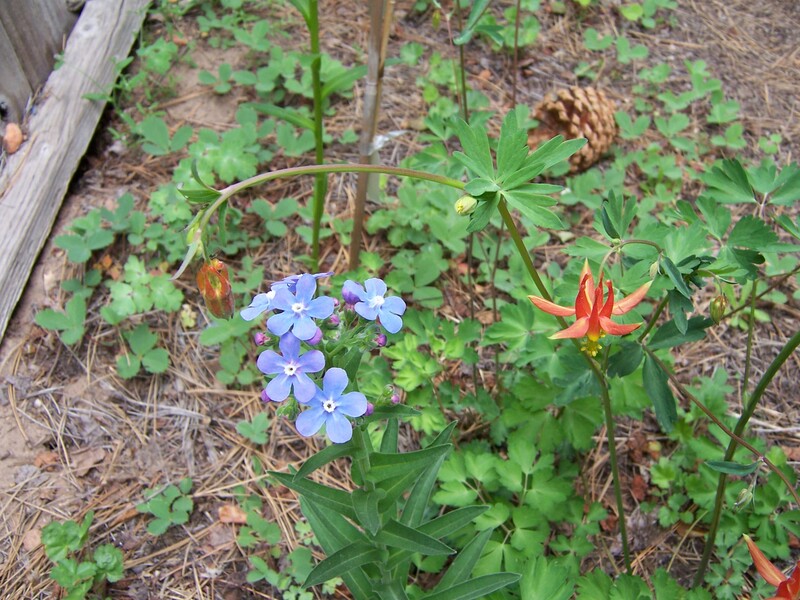 It is fairly common here in Tahoe, and blooms from late spring to early summer. Its flower spikes can get up to three feet tall. Aquilegia formosa hybridizes readily with other varieties of columbine and will seed around the garden. Keep this plant isolated unless you want hybrids. In the central and southern Sierra Nevada, Crimson columbine hybridizes with another Sierra native, the white-flowered Aquilegia pubescens. The hybrids can have spectacular flowers in shades of pink, white, and yellow. Aquilegia pubescens does not occur as far north as the Tahoe basin. 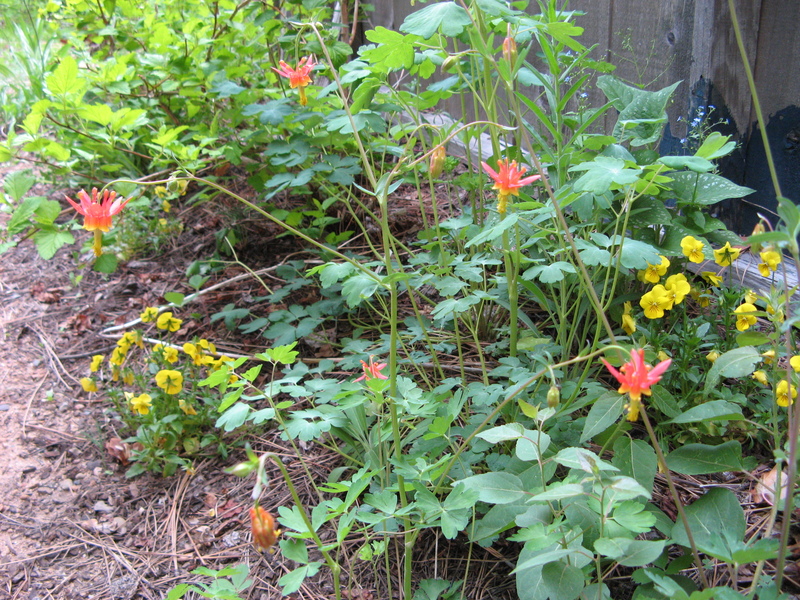 Crimson columbine in the garden with a silver-spotted form of Siberian bugloss, yellow Johnny jump-ups, and shrubby Dart's Gold ninebark in the background on the upper left. 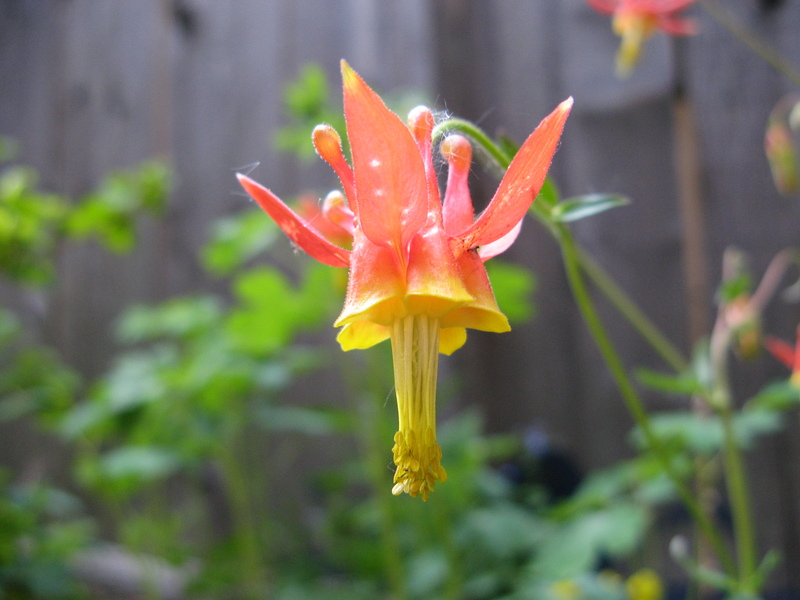 Crimson columbine is easy to grow from seed, either in pots or by sowing the seed directly in the ground in the fall. For pot culture, a standard potting soil works well. I use four-inch pots and plant about six to nine seeds per container about a quarter of an inch below the surface. A thin layer of pumice over the soil helps protect the seeds from drying out during germination, and helps protect the soil surface from hard rain. I prick the seedlings out and pot them up in their own small containers when they have developed several sets of leaves. The plants start blooming in their second year. I have had success starting seeds in pots as late as April. According to Dara Emery’s Seed Propagation of Native California Plants, Aquilegia formosa does not need a cold period to germinate. This species makes a good container plant. This columbine combines beautifully with other native plants that prefer partially shaded, moist conditions like Sticky cinquefoil (Potentilla glandulosa), Fan-leaf cinquefoil (Potentilla flabellifolia), Meadow penstemon (Penstemon rydbergii), Jacob’s ladder (Polemonium occidentale), Coulter’s daisy (Erigeron coulterii), Fendler’s meadow rue (Thalictrum fendleri), Velvety stickseed (Hackelia velutina), and Bigelow’s sneezeweed (Helenium bigelovii). Crimson columbine looks great planted under aspen trees and amongst native grasses. I love sitting out in the garden and watching the hummingbirds go nuts over this plant! Crimson columbine in the garden with beautiful blue velvety stickseed (Hackelia velutina). The groundcover is the native wild strawberry, Fragaria virginiana. Linda, I sent you an email about this. Thank you for your comment!